We work in the North West of England primarily and the same principles of customer service and quality of craftsmanship apply to domestic work as it does to commercial work. We work closely with the home owner and can provide advice on types of tiles and suitability of them for particular circumstances and situations. 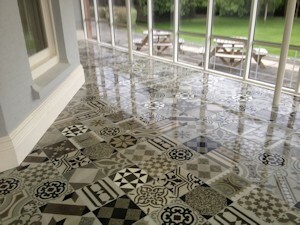 We can also advise on colour schemes, grout colours etc as part of what we do. We can also provide underfloor heating as part of our service provision. We tile Wet rooms, Kitchens, Bathrooms, Conservatories, Lounges, Fireplaces, and work with natural stone such as marble, slate, mosaic tiles, and Victorian type tiles, as well as the more standard ceramic tile. As with our commercial work, customer service and attention to detail are critical in domestic work and the standard of finish will be second to none.